WATERFORD, Conn. — The 2017 Granite State Pro Stock Series season saw one driver capture his second championship. Mike O’Sullivan, a former champion at Thompson Speedway Motorsports Park, wasn’t able to visit Victory Lane in the 12-race schedule. But that didn’t matter. 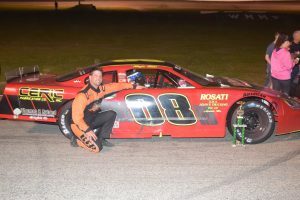 O’Sullivan was consistent enough to roll into the season-finale at New London-Waterford Speedbowl with a four point lead over Scott MacMichael. While his challengers had trouble, O’Sullivan was calm, cool and collective and finished seventh in the 100 lap feature. He avoided a few crashes and settled in late, knowing he just needed to finish well to become a two-time Granite State Series champion. Saturday’s race wasn’t exactly what O’Sullivan was looking for from his competitors either. The early stages of the race were filled with cautions, a lot of them for multi-car crashes all around the track. Luckily, he was able to escape without damage. But it still wasn’t the way he wanted to end the season. One major turning point in the championship chase took place in just the first few laps. His closest challenger, MacMichael, went spinning from second spot right in front of the entire field. Unfortunately, O’Sullivan was the one who got into him and sent him around -not intentionally, though. There was a car stopped at the bottom of turn four and MacMichael checked up. It created the accordion affect. O’Sullivan didn’t even have his own car on the property on Saturday night. His brother, Tommy, who also competes in the series, lended his car over to his brother after Mike was involved in a nasty crash at Thompson a week prior. They knew it would be hard to get the car fixed, but his brother stepped in to help. His fourth career championship is definitely something special. “They are all different, the first one at Thompson was cool, we weren’t really expecting to do that. We ran really good that year and it was a little bit of a surprise. It took us a while to get back there, we won in 2002 and then in 2007,” O’Sullivan said.